The Yayasan Sime Darby Arts Festival (YSDAF) finale returns on Aug 18-19, 2018. Malaysia’s biggest free-for-all arts festival, brought to you by Yayasan Sime Darby (YSD) and The Kuala Lumpur Performing Arts Centre (klpac), aims to enrich your mind and soul with almost 350 arts activities and performances. Held at the sprawling klpac, this year’s YSDAF, themed “You, Me + The Arts,” is a heartfelt edition as it brings different communities under one roof. A festival of diverse voices, YSDAF2018 will see the arts joining hands with other communities and causes. Fuelled by the overwhelming response from previous festivals that garnered more than 30,000 visitors, YSDAF2018 will take you on a journey through crowd favourites as well as new programmes in line with the festival theme. Yayasan Sime Darby Chief Executive Officer Puan Yatela Zainal Abidin says the Foundation aims to use the arts as a vehicle to convey the thoughts and feelings of those whose voices we rarely hear. “We realised that the YSDAF is a solid platform with a brand of its own that could highlight the stories of those from various corners of our society – the corners that we sometimes miss paying attention to in the rush of our daily lives. KLpac’s co-founders Datuk Dr Faridah Merican and Joe Hasham had this to say – “We are especially excited to bring back Adam! The Musical which will be this year’s YSDAF Gala Performance. Originally commissioned by the Malaysian AIDS Foundation, audiences can look forward to a new and improved musical which touches on the AIDS epidemic and challenges faced by people living with HIV. “Also, the all-time popular Life Sdn Bhd series will have a special edition highlighting real stories by real people on trending issues in today’s world.” Both are Executive Producer and Artistic Director respectively. 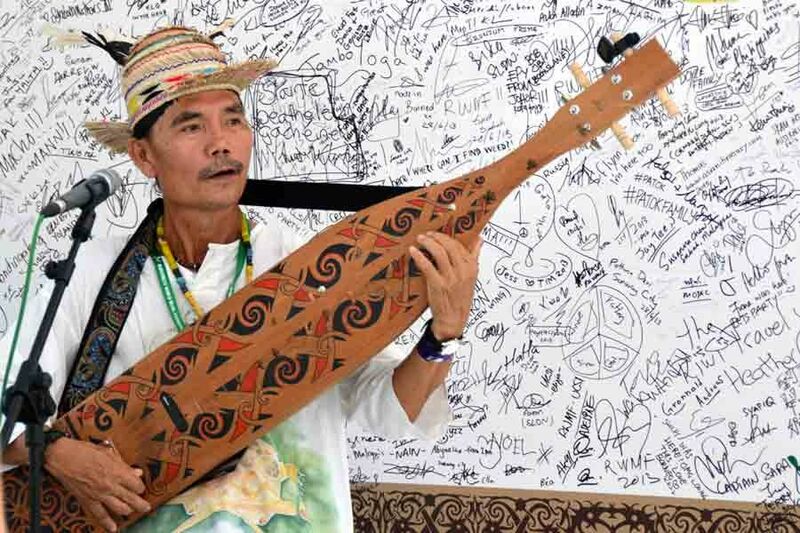 Imagine being serenaded by the latest hit bands, then stepping back in time to learn the traditional instrument sape’ from the master himself, Mathew Ngau Jau, who will be flying in from Sarawak. Put together by a 500-strong contingent of Malaysian artistes and arts workers, nowhere else will you be able to enjoy such a wide sampling of the arts at one go, to include dance, music, comedy, theatre, visual arts and children’s theatre in the form of performances, hands-on workshops, forums, screenings and exhibits. One unique exhibition would be Subject Y by Chin Wen Yen, the winner of YSDAF2018’s Pitch Start grant. A multi-sensory experience catered to the visually and hearing-impaired, Subject Y is an alternative to a traditional museum that plays up the different senses. Music fans must not miss an exciting line up of bands curated by Soundscape Records which comprises indie rock legends Bittersweet, experimental act Pastel Lite and Azmyl Yunor & Orkes Padu. Other highlights include a traditional segment called Sounds & Sights of Orang Ulu by The Tuyang Initiative, award-winning films such as Redha and Adiwiraku as well as crowd favourites like rum Simfoni, Lee Wushu Arts Theatre, Balletbase, Young KL Singers and Kwangtung Dance Company. Families with children can look forward to a storytelling followed by hands-on workshop by Anak Rimba Books, a shadow puppet performance called Hoong Siamang Hooong by Hongjiejie Work Station, giant calligraphy performance by Master Tee, the Kuala Lumpur Children’s Choir, pop up street performers along with other fun activities like batik painting, drum workshops as well as speech and drama workshops. with Soundscape Records. The Top 8 Bands will perform at a satellite event on June 29-30, 2018 at Live Fact, Kota Damansara. The winner will be awarded RM2,000 and a chance to perform at the festival finale. YSDAF2018’s theme is all about people and is an extension of YSD’s work under its Community & Health Pillar. A Malaysian community project to showcase the local arts scene, the biennial festival offers a highly engaging, interactive and feel-good festival experience for children through to adults. The festival finale weekend kickstarts with a contingent of drummers (only) on Saturday, Aug 18, and 8pm, before turning over to Adam! The Musical Gala Performance at 8.30pm. On Sunday (Aug 19), the festival begins at 11am. Visit www.ysdartsfestival.com.my for details and updates.